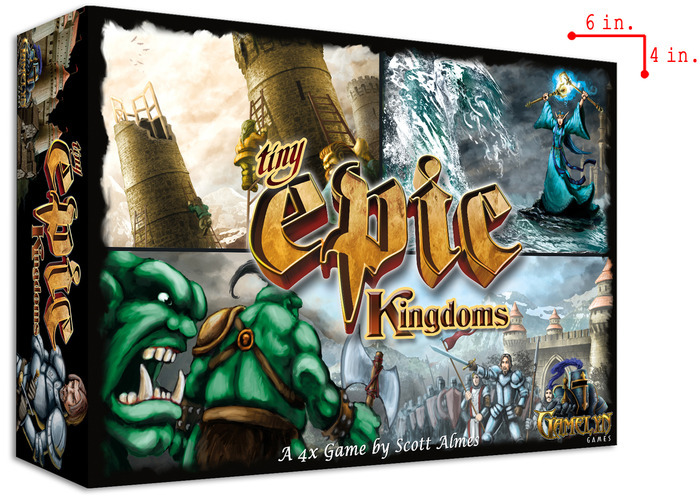 Gamelyn Games launches Tiny Epic Kingdoms today on Kickstarter! From designer Scott Almes (Kings of Air and Steam, Martian Dice) comes Tiny Epic Kingdoms! A 4x MicroGame! It means eXpand, eXplore, eXploit and eXterminate and usually only shows up in games that cost $50+ and take 2hrs+ to play. Well not anymore! Tiny Epic Kingdoms has all the strategy of a traditional 4x game without the cost or the long playing time. Tiny Epic Kingdoms is only $16 and takes only 30-60 minutes to play. This looks to be an amazing game that packs euro gaming more for less than half the price of what we normally pay! Big things come in tiny packages! Battlelore Second Edition To Be Released Soon! You can download the rulebook now to get a head start on the 2nd Edition of Battlelore! “The armies of Terrinoth march the road to war, and BattleLore Second Edition will soon be on sale! In every game ofBattleLore, you take command of a fantasy army and lead it in deadly battle against your foes in the vibrant realm of Terrinoth. Whether you control the cruel, cunning Uthuk Y’llan, or the noble Daqan Lords, you’ll face a tactical challenge like none other. Over the course of the last few months, we’ve conducted a series of previews, examining the difficult choices you’ll make during a game of BattleLore. First, we explored choosing a scenario card at the beginning of the game. You and your opponent each choose a scenario card, determining setup locations, terrain layout, and your individual victory point opportunities. We also looked at the process of mustering an army by spending mustering points. You have the opportunity at the beginning of each game to muster a complete army that suits your preferred play style. Next, we looked at movement and combat in BattleLore. On your turn, you play a command card and order your units into action as you strive to defeat your opponent. Clever movement and positioning are essential to gaining a tactical advantage over your opponent. Once your units finally clash with your opponent’s army, you must destroy enemy units or force them to retreat, allowing you to claim victory-point providing banners for yourself. Catalyst Game Labs Announces New Street Dates for Shadowrun and Battletech Products! Every shadowrunner knows the value of good information. The right fact, the perfect piece of data, can be the difference between success and failure on a run, between life and death. And in the right hands, information can be more than valuable—it can be powerful. The Shadowrun Gamemaster Screen provides a collection of useful tables from Shadowrun, Fifth Edition for ease of reference in game play. With range tables, action lists, combat modifiers, social modifiers, and more, this is a critical game aid to make your Shadowrun games faster and more fun. And to provide that all-important secrecy so that the players don’t know what you’re up to. This screen is for use with Shadowrun, Fifth Edition. Visit http://www.catalystgamelabs.com for more info!